Paper tube mandrels are subjected to the abrasion of miles and miles of paper every day. The type of paper used is normally a very abrasive grade and the mandrels wear at a fairly high rate. The method most used to help improve wear resistance of these components for many years has been chrome plating. While chrome is fairly wear resistant, it is also pretty slick, so startup is often a problem with a newly chromed mandrel. It takes some time for the paper to roughen up the surface and start the wrap and some manufacturers have sanded chrome plated mandrels in order to score up the chrome to get the paper to wrap. 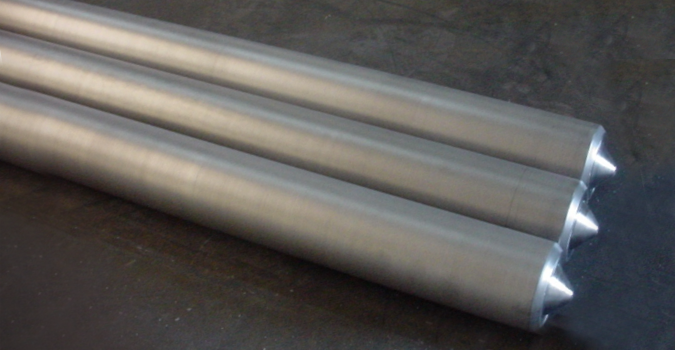 In order to improve the service life of paper tube mandrels, a hard, extremely wear resistant coating is required. Tungsten carbide/cobalt is among the most wear resistant of the thermal spray materials. We have used CT2121-2 Tungsten Carbide Cobalt coatings for some time in our most severe wear applications and it has performed admirably. The coating is applied using High Velocity Oxygen Fuel technology producing hard, extremely abrasion resistant coatings. One maker of paper tubes has replaced chrome plating with our CT2121-2 Tungsten Carbide, going from replating every six weeks to mandrels lasting over a year. These mandrels started up immediately without a break in period saving time and scrap. If you are experiencing wear and erosion of manufacturing parts, contact us to consult with a CTS Engineer and we will respond within 24 hours, or download our whitepaper to learn more about the thermal spray process.